You’re in love, you’re engaged and you’re thinking about your wedding. You want to set a date, you want to say “I do,” and begin your signed, sealed, forever, together. You’ve discussed it and now you have to make a decision. Is it time to visit venues and call a caterer or, is eloping right for you? The actual definition of eloping has traditionally been to run away and get married in secret. The scenario usually involves a need for secrecy. While, you may want to keep your wedding a private matter that doesn’t mean it has to be a secret or a second choice alternative. More and more couples are choosing eloping, or much smaller weddings and the reasons are different for every couple. 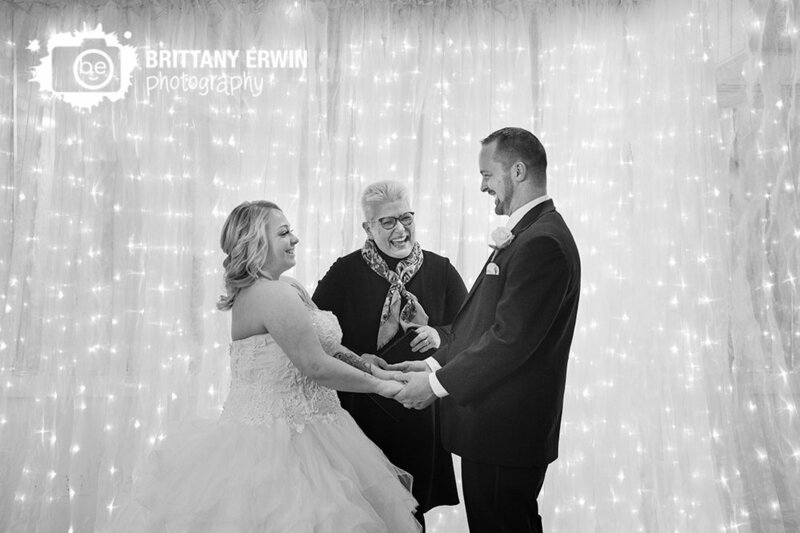 As a wedding officiant in Indiana for the past 8 years, I’ve married thousands of couples and I have been able to see some very interesting trends. Younger, college educated couples are choosing to buy a house over paying for a wedding. After seeing their friends $30K in debt after their weddings, one couple choose a small, backyard wedding with just their parents and siblings. They planned on buying a keg of beer to celebrate with their friends later. Another couple chose to spend their money on a phenomenal honeymoon vacation instead of a huge catering bill. They spent 2 weeks on the coast of Italy, where their parents were happy to join them on the day they exchanged vows and then they all went their separate ways. One of the most beautiful trends I’ve started seeing is couples choosing to do what’s important to them on their wedding day and embracing their choices. They are buying the perfect suit and the perfect wedding dress. Brides are hiring the makeup artist and getting their hair done. They are renting a room or a suite at a downtown hotel. They are making dinner reservations at the best restaurants, maybe for two or for 10. They have the perfect little cake to cut, the wedding song to dance to and a professional photographer to catch it all. They capture the first looks, first kisses and everything in between. They are experiencing the magic of their wedding day in an intimate memorable way as they begin the most intimate journey of their lives. It might just be the two of them or just their parents, grandparents and siblings. When I talk with couples and their families at this small weddings they so happy with the decision. It’s not just the cost savings, it’s the savings of time and energy. They didn’t have to spend a year planning and dealing with endless details. They were able to experience what was most important to them. While I see many happy couples celebrating their marriage with their large families and friends and never regretting a moment, it’s nice to know there are options. You can choose the wedding that is perfect for you. Big thank you to Victoria of Marry Me in Indy for this wonderful guest post about small weddings and elopements. I always love working with her on any size event and we think you will too. You can find her on facebook, instagram, twitter, or the Marry Me in Indy website.